What an incredible, busy month it is for downtown White River businesses! The collaborative Parking Lot Party - Redux! was a huge success, and stay tuned for MORE EVENTS into October. Up next, Piecemeal Pies is proud to host an afternoon with Main Street Alliance of Vermont. ALL SMALL BUSINESS OWNERS ARE WELCOME. If you own a small business in the Upper Valley, come share your challenges and ideas about how Vermont state policy could support locally-owned small businesses, vibrant downtowns, and help foster a thriving local economy. Main Street Alliance will take our experiences, concerns, and ideas to the drawing board in developing their 2019 legislative agenda. Let's get together, eat snacks, and share our ideas for a successful future. (pronounced "one-you") joins us at Piecemeal Pies! for what is sure to be an unforgettable performance. And as always, $5 Fridays! All beer and cider on tap, plus pasties, empanadas, and local fruit hand pies are $5 all day. Friday at the pie shop! 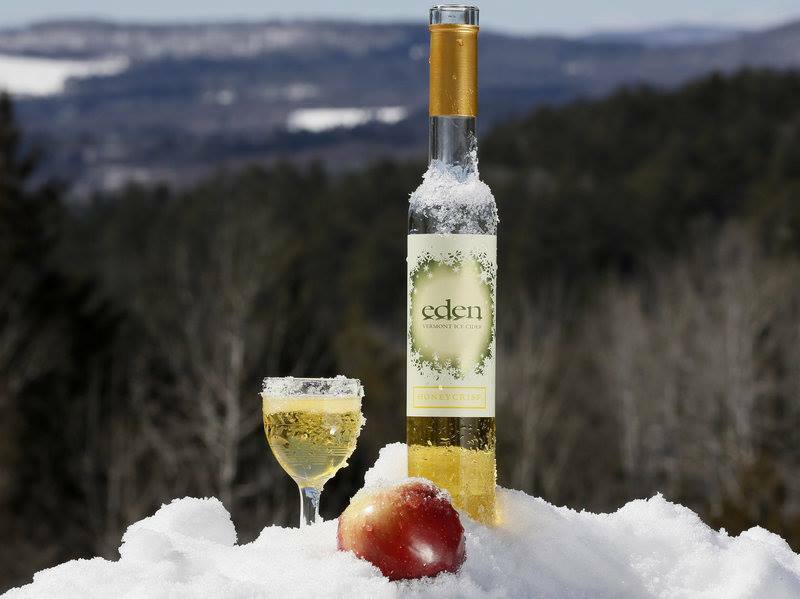 We're open late, and Eden ciders will be joining us for a tasting of their delicious and unique ciders. The lineup will include Piecemeal favorite Imperial Rosé, Sparkling Dry, and barrel-aged Northern Spy Ice Cider. Plus we just tapped a phenomenal Kerr Crab apple cider aged in Cabernet Franc barrels. Or try all of our 5 local ciders on tap with a flight. This is a pretty special opportunity to experience a ton of Vermont ciders in one place! 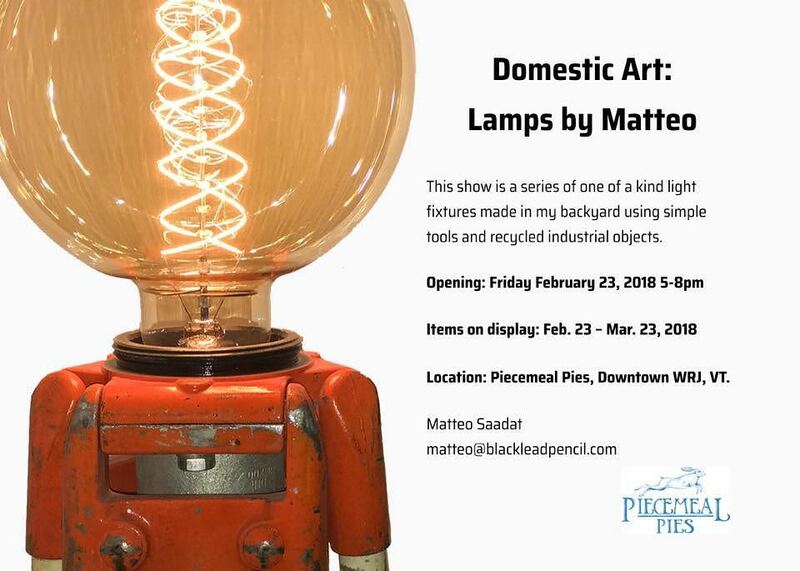 Matteo Saadat presents an art installation at Piecemeal Pies! This show is a series of one of a kind light fixtures made using simple tools and recycled industrial objects. Come to the pie shop Friday Feb23 5pm-8pm for the opening party of this illumination installation. Beer, wine, and $5 Friday ciders on tap! When the children's science museum opens up at night for adults to drink and play with giant bubbles, of course we're gonna be there! Bring your friends to the Montshire Museum in Norwich for the most unique social event in the Upper Valley. DJs, wine and beer, and Piecemeal Pies pasties, empanadas, and sea salt chocolate chip cookies. Only $10 at the door, or $8 presale. Roar! JAG Productions is kicking off it's annual festival with a party at Piecemeal! The festival showcases and celebrates new plays by emerging African-American playwrights. Come support Vermont's first African-American theater company with a night of dancing, drinking, and feasting at another one of Piecemeal's much-talked-about epic parties! Music by house DJ Sean, flowing beer, cider, wine, and champagne, and our addictive Thai Bar Snacks. $10 at the door, free for JAGfest ticket holders. Please RSVP by emailing marketingintern@jagproductionsvt.com. Live music by special guest Elias Krell. Opera singer turned scholar and singer-songwriter, Elias Krell performs "dream pop in Spanish and English". 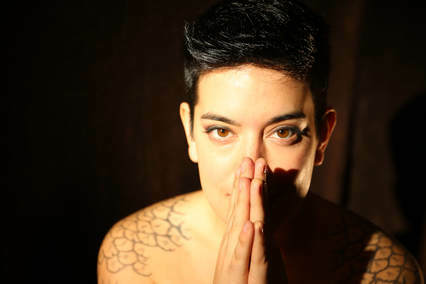 Join us on First Friday to experience their truly beautiful voice, moving words, and unique energy. Every week is $5 Friday! All beers and ciders on tap, plus pasties and empanadas are just $5 all day. We'll be open till 8pm. RESOLUTIONS - the ultimate New Years Eve Party! Hey Upper Valley, it's a new year!!! Let's be honest. 2017... kinda sucked. But THIS PARTY is gonna be the most epic way to ring in 2018! Amazing DJs, Burlesque performances, cocktails by the talented Gabrielle Varela, and produced by the Piecemeal crew who really know how to throw a damn good party. Only $10 at the door (free admission for early birds! ), which includes raffle entries and really good cava bubbles at midnight. Oysters and Thai bar snacks. 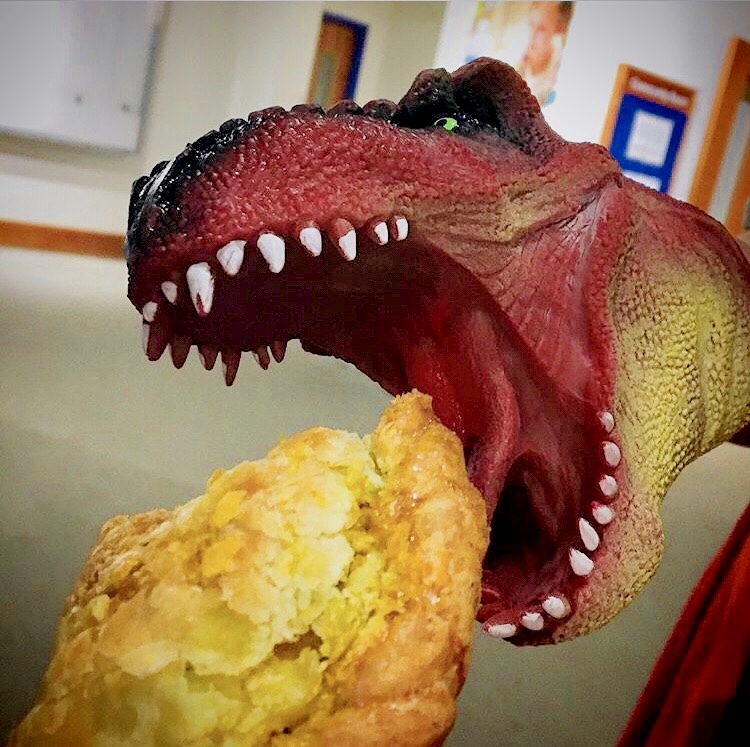 Join us at the pie shop this FIRST FRIDAY in WRJ!!! Photographer Seth Harper Goodwin will be showing his incredible work, including this moving photograph which will be a semi-permanent addition to our cafe. Ciders will be flowing and snacks will be devoured! Cedar Circle Farm in East Thetford will be delivering CSA shares (boxes of farm fresh organic veggies!) to the pie shop each Friday afternoon from May 26–December 15. If you've signed up for a share, plan to come to the pie shop between 2pm and 6:30pm to pick up. The Fattoria Fibbano Winery is in the heart of the Tuscan countryside, in the area of the council of Terricciola, in the hills between Pisa and Volterra. The Cantoni family produces wines using only indigenous Tuscan grapes. They believe in wine production that is born of a precise place and becomes like a book that tells the story of a land and the people who live on it. Piecemeal Pies will create a dinner around five of Fibbiano’s organically-cultivated wines: one white wine, and four beautiful reds. We will dine family-style as we listen to Matteo Cantoni speak of his, and brother Nicola’s, wines. Price per person is $80 — $55 food cost & a subsidized $25 wine cost. We're open late for First Friday! Stop by, eat some snacks, drink some cider, meet some friends. Join us for cider tastings with Shacksbury and Stowe Cider. And it's CSA signup season! Cedar Circle Farm will be here with info about their 2017 CSA shares. Did you know you can sign up to pick up your weekly veggie box at Piecemeal Pies? Ring in the New Year at Piecemeal Pies! We'll be celebrating, and welcoming 2017 in style with awesome dance music, Polaroid photo booth, board games, pasties, bar snacks, cider flights, and champagne! Cider maker Colin Davis of Shacksbury Cider will be joining us for White River Junction's First Friday, December 2nd! Come taste their exceptional ciders made from New England farmstead apples and Old World orchards in England and Spain.